No Bake Peanut Butter Chocolate Cookies combine two great flavors – chocolate chips and peanut butter – producing a taste and texture that will remind you of Reese’s Peanut Butter Cups. 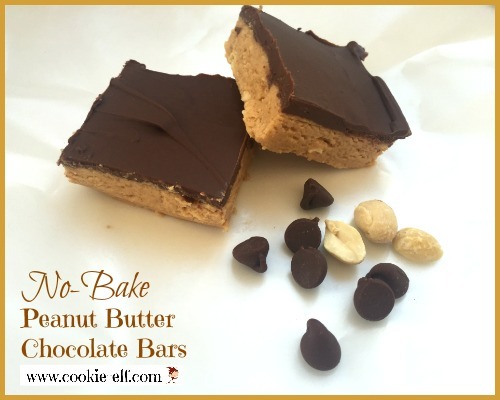 The bars are more a confection than a straight-up cookie. They contain no flour, making them a favorite among the gluten-free crowd. In a large bowl, using an electric mixer on medium speed, cream together butter, brown sugar, powdered sugar, and peanut butter until well blended. Mix in peanuts. Pat dough evenly into an ungreased jelly roll pan (15 x 10). Use the heel of your hand to flatten the dough surface. Spoon melted chocolate over bars. Use a knife or a spatula to spread chocolate evenly over bars. Score bars into bite-sized pieces before chocolate sets. Chill bars in the refrigerator 15-30 minutes or longer before removing them from the pan. Re-cut bars carefully along scored lines. Remove bars from the pan. Place waxed paper in between layers to store them. When preparing No Bake Peanut Butter Chocolate Cookies, be sure to use smooth peanut butter rather than chunky, as the recipe calls for adding peanuts. For an easy, no-mess way to measure peanut butter, coat the measuring cup with cooking spray before you spoon in the peanut butter.